I still love watching '80s television shows. Car chases, jumps, burnouts...stunt drivers were definitely in high demand throughout the decade. There is just something about those live action stunts that made shows just plain fun to watch. Do you remember the first time somebody told you that K.I.T.T. didn't actually turbo boost? That it was just a bunch of ramps and stunt drivers? It was like the first time your heard that Santa Claus didn't exist (oops, spoiler alert!) But between the TV producers and these insane drivers, they made it believable to us youngsters who were watching. The star of the show's vehicle became a character in its own right for dozens of shows in the '80s. From futuristic, multi-million dollar creations to sleek sports cars, it seemed like every popular TV show had a cool vehicle to either fight the bad guys or to be a extension of a character. 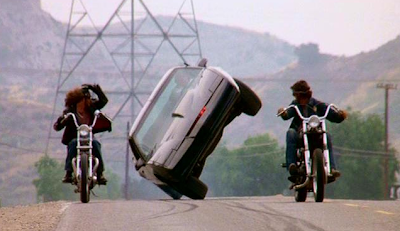 Let's revisit some of these rad rides of 80s TV shows and compile our favorites! This week's guest ranker is Michael from Retromash! Michael posted a great list for last week's Private Detective Rank 'Em and I decided to invite him back. He's planning a new 70s/80s/90s retro website soon, so I invite everyone to follow him on Twitter @Retromash in the meantime. Michael suggested this week's topic, which is ironic because I've had this idea on my mind for awhile. For the purposes of this list, we are looking for any vehicles from '80s live-action TV shows. (Sorry Ecto-1 & Turbo Teen fans, we'll visit the movie and animated vehicle lists another time.) I've compiled a short list below. If I miss your favorite, feel free to add it to your list. Let's do it!! 1978 Ferrari 308 GTS & T.C. 's Island Hopper helicopter from Magnum P.I. Firstly, I just love any Lamborghini Countach anyway. It's the archetypal '80s pop culture car. 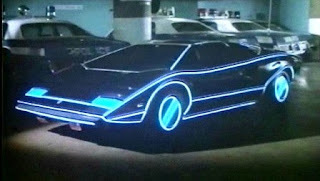 But when it is drawn by an electronic dot called Cursor out of thin air, has neon blue trim, and turns corners at 90 degrees...then Automan's Countach has to take the no.1 spot. Following up in a very close second is K.I.T.T. from Knight Rider. A beautiful, sleek black 1982 Pontiac Trans Am with a glowing red Cylon-esque light on the front. What else do you need? (apart from a molecular bonded shell, turbo boost, and enough gadgets to make Dr. Claw strangle his cat.) And to top it all off you had the real star of the show, the A.I. computer voiced by William Daniels. Next up is the most famous van in the world...B.A. 's van from the A-Team. Beautiful spoilers, beautiful wheels, beautiful paint job. This 1983 GMC Vandura was always ready for action and really became an icon of the show (and a character all of its own.) In the no. 4 spot, I have Street Hawk. Although it was actually a modified 1984 Honda XR500, it was way more than that as Street Hawk. It was black, futuristic, had built-in machine guns, and could travel at speeds of over 300 mph using hyper thrust. I knew I could never own a Street Hawk myself but I always wanted a Raleigh Vektar BMX as I thought that might be a close replacement. And in 5th place is the iconic 1986 Miami Vice white Ferrari Testarossa. This just oozed style and power. If cars could have shoulder pads and linen suits, then this one would have had it. I like how there is a Countach and a Testarossa topping and tailing my Top 5. These are the two cars I had on posters on my bedroom wall in the 80s...next to the one of a whale. K.I.T.T. will always be my #1 on whatever vehicle list you can come up with. I can even make a case for top TV boats list. If this was a top 10 list, I might even add K.A.R.R. just for the fact it had Peter Cullen's voice. I always thought Street Hawk had a Batman quality except we a way cooler Batcycle. Turbo boost, guns, and super speed; everything you need for a motorcycle vigilante. Airwolf is the coolest copter on the planet. As much as I love the personality of "Screaming Mimi" and design of Blue Thunder (don't forget the TV series,) nothing tops turbos and glowing missiles. B.A. 's van just fit perfect with team. But the way B.A. cared for it and would "pity" anyone who did it wrong, really elevated it to another level. Every time I think about the Coyote X, I picture the real-life representation of Hot Wheels cars in the '80s. The bubble dome and mag wheels just screams to be put on a plastic orange track. Your turn! Post your Top 5 TV show vehicles in the comment section below! Don't forget to leave your Twitter handle if you want to be a future guest ranker. And, check out more Top 5 lists in the Rank 'Em Archive! 5) The futuristic trucks from the Highwayman series (Thought it would be awesome to see Airwolf as the chopper portion of the truck) - Call me crazy! Yea, but the more I thought about it, I really like Airwolf the best out of them all...even my beloved General!